A Ukrainian tugboat is being rammed by a Russian naval ship. 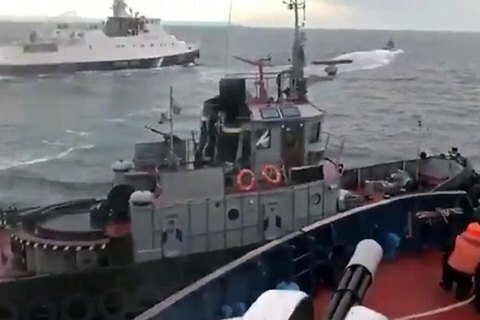 The Prosecutor-General's Office (PGO) of Ukraine has presented a re-enactment of the Russian Coast Guard's attack on the Ukrainian naval vessels off the Kerch Strait. The investigation collected 17 volumes of evidence proving that Russia had committed an act of aggression against the Ukrainian Navy, PGP spokesperson Larysa Sarhan said on Facebook. “In particular, we interviewed 75 witnesses (Navy Command, officers on duty and their assistants, the crews of the Horlivka and Balta ships, and other military officials), as well as three victims – relatives of the wounded sailors; made 51 reviews of documents and websites; inspected two ships (Horlivka and Balta), which returned to the port of Odesa; obtained evidence [in the form ] of radio communications between the ships of the Russian Black Sea Fleet, the Border Service of Russia's Federal Security Service (FSB), the Russian Air Force and Air Defence about the aggressive actions, the attacks on the Ukrainian Navy vessels and their crews; the voice samples of the main witnesses, the crews of the Horlivka and Balta ships were taken; and warrants for temporary access to items and documents in Odesa and Kyiv were received," she said. Among them are Adm Gennadiy Medvedev, chief of the Coast Guard and deputy chief of the FSB's Border Service; Alexey Salyaev, commander of the Don coast guard ship (that rammed a Ukrainian tug); and Andrei Shipykin, commander of the Izumrud coast guard ship (that fired on the Ukrainian vessels). In the near future, the notices of suspicion are expected to be served to over 10 servicemen of the Russian Black Sea Fleet, the FSB Border Service, the Air Force and Air Defence, ranging from junior officers to generals. As reported earlier, on 25 November, the Ukrainian Navy's small armoured artillery boats Berdyansk and Nikopol, as well as the Yany Kapu tugboat were sailing from the Black Sea port of Odea to Mariupol on the Sea of Azov. Four Russian coast guard ships intercepted the group near the Kerch Strait. The Russian border ship, Don, rammed the Ukrainian tugboat, damaging it. The Ukrainian crews then reversed and started moving towards the exit from the strait, but the Russian ships began the pursuit. They opened fire and eventually captured the ships and their crews. On 27-28 November, a Russia-controlled court in Crimea arrested all the Ukrainian sailors, including the injured ones, for 60 days. They were accused of "illegally crossing the Russian border".